DSynth / Shadows of Luminosity, Noise/Sound Design Sample from Bela D Media. Bela D Media has announced the release of DSynth / Shadows of Luminosity for Native Instruments' Kontakt. DSynth is a tool combined with a collection of synthetic sounds and instruments from electronic dance to ambient film score. DSynth was designed from the very beginning to be a work in progress. The included PCM data is selected original raw material to be used for future development of patches by Bela D Media and by you, the user. All raw materials are accessible to be used as a starting point for future development by the end user. Since the samples are not locked, users can manipulate and modify the sounds however they wish. According to Bela D, almost every form of synthesis has been used to create data for this library and content was carefully chosen in order to take full advantage of the subtractive, formant, and granular sampling synthesis potential within Native Instruments Kontakt. We're told that much of the PCM data inside DSynth was generated by the Bela D Media product catalog. The user control is apparently enhanced with the inclusion of the DARP script. DARP is not only a pattern recorder (both real-time and step time), an arpeggiator, or a drum machine – it is supposed to be all of these things - and more. 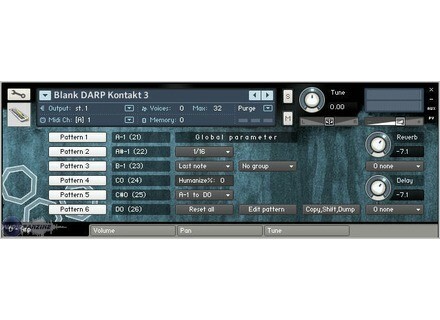 DARP is designed to add six-part "wave sequencing" features to Kontakt, among other things. Each "wave sequence" pattern can trigger "round robin" or "cycling" groups, as well as release triggers for each pattern. 1. Analog: Sounds similar to what you would find in classic analog subtractive synthesizers. 2. Digital: Sounds that sound like more modern digital synthesizers such as FM, AM, PD, Ring Modulation, Additive, Granular, and Formant types of samples and synthesis. 3. Hybrid: Sounds are a combination of analog and digital. 4. Organic/Thematic: Simulated or sampled natural sounds that normally emulate a setting – such as a forest or a battle field. Some of these are more musical rather than just sound effects. 5. Instrument: Sounds very much like (or is, in fact) a sampled instrument. 6. Soundscape: Evolving textures that use any or all methods. 7. IES – (Impulse Excitation Synthesis): A type of synthesis that uses impulse response technology as part of the sound itself, rather than being used just an effect. 8. SFX – Sound Effect: Sounds that do not necessarily correspond to key or pitch. 9. Percussion: Both real (sampled) and synthetic drum and percussion sounds. DTools is an additional feature that includes templates for quickly building your own DSynth patches. Dsynth | Shadows of Luminosity for Kontakt (v2.21 or higher) is available for purchase now priced at $149.99. Algorithmix K-Stereo Ambience Processor Algorithmix has announced the release of K-Stereo Ambience Processor which they claim is the world's first "Ambience Recovery Processor".